This Upgrade Guide details the step-by-step process for upgrading your vCenter Server from 5.1 to 5.5 Update 1c. Also included is the build of a new Windows Server 2012 R2 OS for the vCenter 5.5 services whilst maintaining a separate SQL Server 2008 R2 Database. 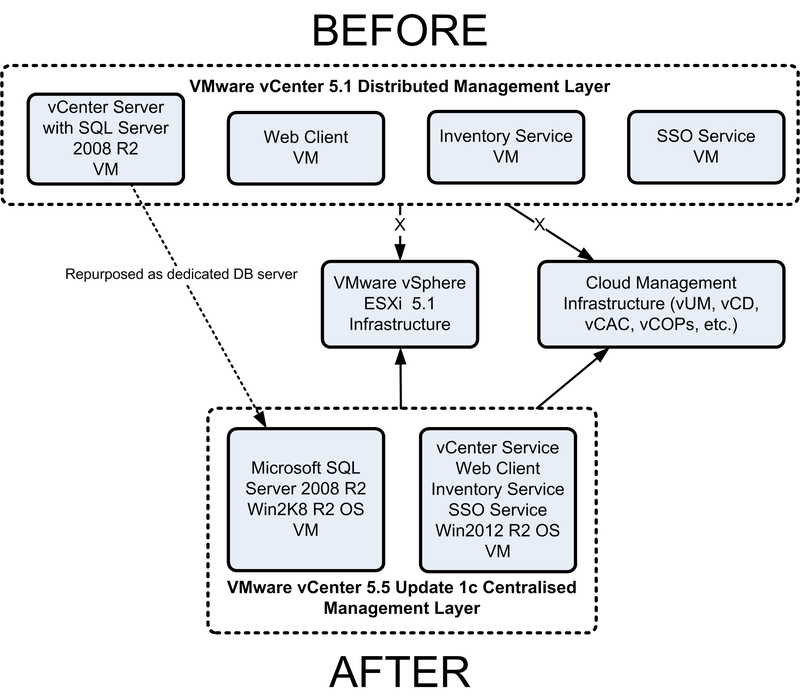 I was unfortunate enough to make the decision to deploy the distributed vCenter model in vSphere 5.0, which I maintained through to vSphere 5.1 with SSO 5.1, which has been an operational nightmare to manage. This post also covers the consolidation of the distributed model to a centralised vCenter setup with an existing, separate Database server. Shutdown the existing vCenter services and re-purpose the existing hybrid vCenter/Database server to be a dedicated Database server. This process takes approximately 3 hours. Download the Binaries for Windows Server 2012 R2, SQL Server 2008 R2 & VMware vCenter 5.5 Update 1c (Build 1945270). Copy these binaries to a Datastore that is accessible by the Management hosts. Configure a DRS VM-Host rule that places all vCenter infrastructure on the same Management host, this way you will only need one vSphere Client connection during the upgrade. Take vSphere Snapshots of all vCenter server infrastructure VMs, including vUM, vC Ops, vIN, vCM, CBM, etc. This will allow you to roll-back quickly if things go wrong. Take a full database consistent backup of your vCenter Database server. Document the RBAC configuration for the entire vCenter hierarchy. This will be recreated manually. NOTE: if your vCenter server and SSO service are on the same VM, then the upgrade process will upgrade the service, maintaining the RBAC configuration (see Alternatives heading below). The SSO 5.1 user “admin@SYSTEM-DOMAIN” has changed to “administrator@vsphere.local” in SSO 5.5. You have checked that all of your vCenter plugins and third party services support vSphere 5.5 Update 1c. You have the necessary procedures for any re-integration tasks. You have a fully functioning vSphere environment with virtual machines running. No Physical vCenter servers. This process does not migrate the vCenter 5.1 SSO server data to vCenter 5.5. All permissions will be recreated from scratch. Roll-back – original vSphere infrastructure is a “snapshot restore” away if the upgrade process fails. Migrate the SSO 5.1 service to the Windows 2012 R2 server and then upgrade the SSO 5.1 service to SSO 5.5. Upgrade the existing vCenter 5.1/DB server from 5.1 to 5.5 U1c. WARNING: Inventory service installation failed with “Expired SSL Certificate” errors, even though the certificates had been regenerated and were valid. Wahl Network – Migrating a vCenter Server Installation? Don’t Forget Your SSL Certificates! You can now move to Part 2 of the Configuration Guide.